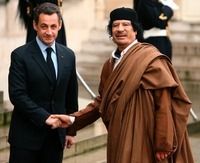 Did Qadhafi finance Sarkozy's election campaign? Back in the early days of Libya war, the reasons for France's rapid intervention were the subject of much discussion. One of the rumors that was floating was that Nicolas Sarkozy, France's president, was eager to cover up the Qaddafi regime's close ties with his own party and business networks including the financing of Sarkozy's presidential campaign in 2007. The rumor has now come back with a vengeance and possibly, proof. The quality (anti-Sarkozy) website mediapart.fr has published an incendiary document suggesting that the campaign was financed through Saif Islam al-Qadhafi to the tune of €50 million. The document, which was leaked by government sources and had previously been part of the evidence in a case involving the relationship between Sarkozy's party and the arms dealer Ziad Takieddin, suggests an elaborate setup negotiated between the Qadhafis and Sarkozy's advisors. The money was laundered through a Panama-based shell company and the Swiss bank accounts of the sister of a prominent right-wing politician also close to Sarkozy, according to mediapart. Takieddin was also known to be a troubleshooter and fixer for the French Interior Ministry in seeking contracts for French companies that provide security services, including for Saudi Arabia. In March 2011, just a few days before French jets struck Libyan army vehicles moving towards Benghazi, Saif al Islam gave an interview in which he demanded that France return the money used in the presidential campaign, threatening that he had details of bank accounts that could incriminate Sarkozy. This was ignored at the time, and dismissed as an attempt to embarrass the French. What is beyond dispute, though, is that the Sarkozy administration had close an fruitful ties with the Qaddafi regime, both formally and through back channels. Although this remains to be confirmed, it appears consistent with widespread rumors going back to at least the 1970s of illicit financing of right-wing little parties and candidates by Arab and African dictators. Jacques Chirac for instance was commonly said to have received campaign baksheesh from Lebanon's Rafiq Hariri and Morocco's Hassan II. This latest affair is part of a growing scandal dossier involving Sarkozy party and his entourage — one that could become a major reason he loses his reelection bid in May.